You know what? There's no way that I have found to make potato and cabbage soup look attractive in a photograph. Admittedly, my kitchen has lousy lighting, and my camera is hopelessly obsolescent by the standards of our time. Likewise, there's no way to make "potato and cabbage soup" sound anything other than dreary. My soup tasted good, and I'll get to all that in a minute. Right now I'm just going to tell you that the cabbage itself was gorgeous, and the picture above doesn't begin to do it justice. It was a mild Sunday, and I was out in the garden, checking things out. Little shoots of garlic poking up, pathetic looking leeks and cabbages that had never been harvested. Short rows of tatsoi that looked like they may have actually overwintered. No sign yet of the long awaited asparagus. 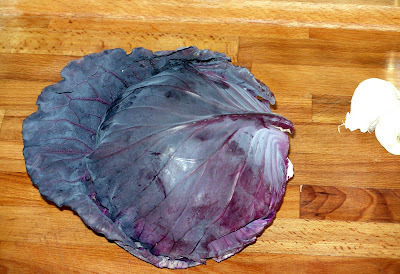 But there among the bedraggled heads of cabbage was one that had a robust red-purple color and some physical integrity. One of its outer leaves curled protectively over the head like a bonnet. Did appearances deceive? I reached down and gave it a gentle squeeze. It was firm and dense! Maybe it wasn't the biggest cabbage, but it was ready to eat. And I was ready to eat it. I came inside and started putting a pot of soup together. I hardly even bother researching recipes these days, because meals pretty much come down to eating what we have on hand. And late winter is lean pickin's, I don't mind telling you. So. Candidate ingredients to go with the cabbage included our potatoes and garlic, boughten onions and carrots, a tiny bit of pork sausage (pastured meat from a local farm), some homemade canned stock, and spices. From there, the recipe wrote itself. Take the sausage out of its casing, break it into little bits and brown them in a soup pot. When that's done, set them aside and cook a big, finely diced onion in the remaining pork fat with a bit of added butter. Sweat, sweat, till soft and golden, adding white pepper, kosher salt, caraway seed, and bay leaves while it cooks. Then stir in some minced garlic to cook a bit. Add a quart of stock and a pint of water and heat it slowly, so as to have time to scrub the potatoes (purple!) and chop them into bite sized pieces. Add the potatoes (~1.25#/~0.5 kg) in the warming liquid, then finely chop half of the cabbage head. Add that in along with the cooked sausage as the liquid starts to simmer. Grate a couple carrots with a cheese grater. Pour a glass of wine, reduce the heat to minimum, cover the pot, and walk away for a few minutes. Come back, add the carrots, and taste to adjust the seasonings. A tad more salt. Perfect. Serve and eat. With crusty bread if you like. It was good soup, even if the potatoes were not the best variety for soup. The stock made from the Thanksgiving turkey that was smoked with rosemary and apple wood chips really made the soup pop. I'll even acknowledge the possibility that without superb stock, the soup might not have amounted to much. Good though the soup was, harvest meals over the winter tend not to be very exciting. The word "stodge" often lurks just below the level of utterance. Maybe it's the fact that we're mostly locked in to relying in a very small number of foods that don't change much for months on end. Spring, summer, and fall are different; the variety is wider and ever changing. I'm still working on learning how to eat from our own stores through the winter months, with many failures and hard lessons. But mostly I'm just ready for spring. I cannot wait for the first snow peas, and arugula, and chives, and asparagus - fresh green things. In the meantime, I practice gratitude that we have plenty to eat. Spring is not quite here and already volunteers through the WWOOF program are beating down our doors. So far we have three young people scheduled to join us in March. I was a bit hesitant to take them on so early in the year, thinking that it's really not the best time to teach much about what we do here. But I decided I would just give them fair warning about weather, and the lack of many growing things, and take whatever volunteer help still wanted to show up. What I've learned about the WWOOF program is that I have to be on my game when volunteers turn up. I do more work when they're here than otherwise, and not just because it's much like having house guests. I want to keep them busy for the agreed upon half-day of work, sure. There's no sense accepting volunteers and not making good use of the help. But I also feel a sense of responsibility to teach these volunteers. Maybe they don't expect as much as that, but I can't help myself. And in order to teach, I have to be out there, showing, talking, demonstrating. Projects have to be ready to tackle. And in order to do that, well, I've got to do my homework. Such as ordering some new hens. You see, in the last month an egg eating habit has developed in the hen house. This is a bad habit, one of the worst that hens can have, from my perspective. I'm not sentimental about my hens. I value them and treat them well, but they're not pets. They're here to provide us with eggs to eat and to barter, and to produce manure and help control insect pests. When they eat their own eggs, they're not adding value. I don't know how the habit developed, but I've seen evidence of at least five eggs eaten this month. I don't know if it's one hen doing all the damage or if they've all learned that eggs are good to eat. To me, it's immaterial. Repercussions will be positively Old Testament; punishment will be meted out collectively. So this batch of hens is going as soon as I can replace them with new layers. Which brings me back to the volunteers showing up early next week. One of the young men we'll be hosting specifically wanted to learn about chickens, and another about slaughtering. I didn't think we'd be able to accommodate the second interest, since our layers are still relatively young. But a bad case of egg eating changes things. So I think we'll not only be slaughtering, and processing chickens, but also pressure canning some tough birds and making chicken stock too. Good things for strapping young lads to know, I'd say. If we get another run of bad weather, there will be minor DIY projects for the garden to pursue in the garage, and bread baking in the kitchen. Otherwise, we'll start the early spring tasks in the garden. I've also ordered a couple slabs of pork belly from one of my farmers, to turn into bacon. So I'll be able to teach a bit about curing while the lads are here. Somehow I suspect that if the guys think canning and bread baking is sissy work, they'll take a different view of makin' bacon. (And yes, I checked; they're carnivores.) It's exciting to me too; I've never made bacon at home before. I know that as WWOOF host sites go, our homestead is not the norm, and so neither are the activities that our volunteers pitch in with. Most WWOOF hosts are proper farms. Sometimes I feel a bit apologetic about this, but in the end I think what we have to teach are good, practical skills. In other news, seed starting has begun. So far it's just the early stuff indoors, and some experimental frost sowing outdoors. I've been working on breaking down all the branches pruned from our apple tree early this year. It finally struck me as absurd that we haul our branches down to the yard waste facility, and then haul back finished compost and mulch. We'll still go for the free soil building materials, but I've decided not to part with the soil building materials we've got onsite. So I've been cutting up the very small branches with hand pruners, and spreading the bits all around our fruit trees. It's a slow job, but it's just nice to be outside for an hour or two this time of year. And the spring overload hasn't yet begun, so I've got the time. Okay, final bit of news is a heads up for you readers. I've ordered a few copies of Kelly Coyne and Erik Knutzen's book, The Urban Homestead . I'll be giving away two copies here when the books arrive, but it looks as though I ordered the expanded and revised version, which won't ship out until mid-March. As soon as the order ships, I'll post a giveaway here. So check back later for a chance to win a new and improved copy of the book. 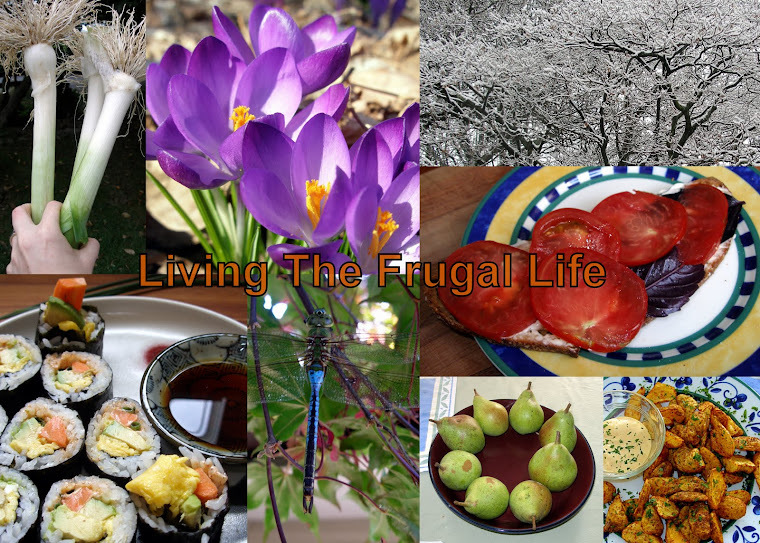 In the meantime, you can check out their great urban homesteading blog. Time to report on my experiment in keeping a rosemary plant alive through a zone 6 winter. Last fall I assembled one of Tamar and Kevin's instant mini-greenhouses, made from two window well covers, for my rosemary plant. I had previously done a little homework to find a variety of rosemary noted for its hardiness, relative to other rosemary varieties. I settled on the un-euphoniously named Arp rosemary, said to be hardy in zone 7, or only half a zone off our bit of earth. 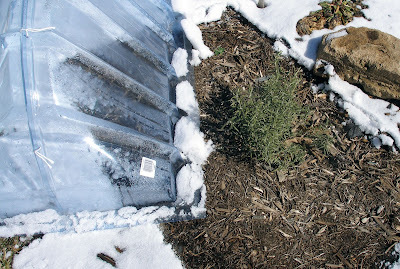 I drilled a few small holes for ventilation at the top of my greenhouse and began covering the rosemary in November. It came through the hard frosts of late fall just fine, retaining its green leaves fresh and ready for the picking. I was pretty sure the truly cold temperatures of winter would send it into dormancy, and they did. I could see no new growth, and the leaves took on a somewhat dull tone. The question was, would protection from the wind and direct contact with snow be enough to let it survive? With such a small space protected, there wouldn't be much advantage, if any, in terms of temperature. A greenhouse large enough for a person to walk around in would certainly do the trick. But this greenhouse was essentially a flimsy cloche; not thick enough or big enough to hold heat overnight. All I could do was wait out winter's harshness and see how the rosemary fared. Our big dump of snow came towards the end of January, and we've had snow on the ground ever since. 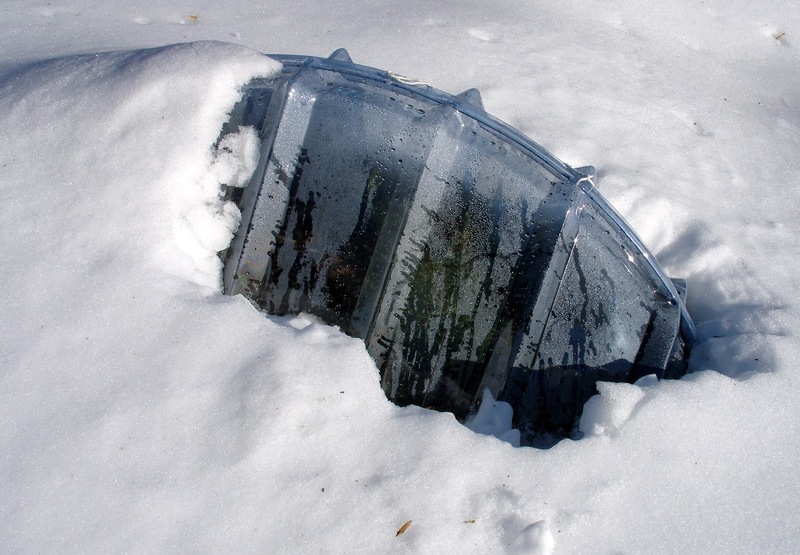 The snow covered the mini-greenhouse completely for several days. I went out and scraped off some of the snow, to allow a little light in to warm up the space inside. I suspect the snow that had built up around the sides then acted as insulation. We're nearly to the end of February now. Historically the coldest month of the year here is January, though we often see more snow in other months. We're still seeing overnight temperatures substantially below freezing. But we should only be headed into temperatures that trend warmer. Today I checked the plant under there and found it looking fine. It still has a wonderful scent, and the thicker stems are supple under my testing fingers. They bend without breaking. The color of the leaves is still dull green. But green they are. I'm pretty confident saying that the rosemary has survived with the help of this protection. The plant will probably need the shelter of the mini-greenhouse for at least another six weeks though. Now that I know I can keep rosemary alive through a zone 6b winter, I wonder how much farther north this would work. Any northern type gardeners out there tempted to try? To keep this particular plant over the long term I'll have to keep it pruned such that it fits under the cover. Or else start new plants each year. There's enough room under there right now to accommodate another plant. I may add some early peas in the next couple weeks. But after the peas are done I might try planting some flat-leaf parsley alongside the rosemary, and see if parsley can also make it through next winter with a bit of shelter. Home grown, nutritionally dense fresh parsley would be mighty welcome through the winter months. Of course, a little success gets me scheming about other things I could plant, other non-hardy stuff I could drag into my hardiness zone by adding a few more shelters. While it was ridiculously easy to make this mini-greenhouse from two window well covers, it wasn't exactly cheap. Not by my standards anyway. I bought the heavy-duty ten-year covers, and I think it ended up costing about $30. I expect they'll last even longer than ten years, since I'll store them in the shade for most of the year. But I'm still going to keep an eye out for any other materials that might be repurposed for the cause. I'm thinking an old skylight or the globe of a street lamp might do the trick, if I ever came across something like that in a dumpster. I could also experiment with straw bales again. I have plenty of salvaged storm windows to work with as lids for straw bale frames, and overwintered straw bales make such nice mulch in the spring. My writing muse mostly deserted me for a while there. But I feel a post on the PASA conference is owing, and I also recently attended a mini-seminar on potatoes. So I figure I can summarize useful stuff I picked up in one go. Here's a rundown of things good things that happened at the conference and things I've learned recently. As usual, there were free seed packets to be had at the conference. I got some from Seed Savers Exchange but also found to my chagrin that they were giving away some I had just ordered from them. Johnny's, also as usual, had a free shipping coupon on offer as well as their nifty 14-month calendar, which will hold me till next year's conference. Knowing Johnny's typically gave out this coupon, I managed to hold off ordering from them until after the conference. There were also nice coupons and useful schwag such as pencils and pens from Organic Valley. Lots of good free noshy bits were available at various times too. I bid on a few lovely things at the auction, but didn't win, so I came home having blown less money than I did last year. New at the conference this year was an informal seed swap table. I picked up some cilantro and echinacea seeds. I'll try to remember to bring some of my own seed next year to give away. I learned about a very promising technique for trellising tomatoes that involves pretty serious pruning, which I plan to try this year. I know my track record is execrable when it comes to delivering posts I promise to write "soon." So I'll just say that when it's time to put my tomatoes in the ground, I'll try to get a post or two together on this trellising technique. I should say that I put my tomatoes starts in about ten days later than most gardeners in my area, around June 1st. Then the trellising doesn't really start until the plants have grown for 3-4 weeks. If you want to play along with this trellising method on the strength of my non-existent description of it, I can tell you it will require very sturdy and tall metal posts; one for every ten feet or so of row. T-posts are preferable, but the very large U-posts can work too, and that's what I'll be using. It also calls for aluminum wire, preferably 15-, 16-, or 17-gauge. Twine is definitely not a viable alternative to the wire for this method. And you'll need something to clip the plants to the wire. Twisty ties can work, but the farmer recommended the reusable, cheap, and easy-to-use tomato clips from Johnny's. She didn't say how many per plant, but I would think 10 per plant would be in the right neighborhood. Okay, here are a couple of bite-sized tips I can pass along from the conference. Those posts mentioned for the tomato trellising - they're not the easiest thing for one person to pound into the ground. Particularly if that post is 7' tall and that person is an average woman. There's a great tool that makes the job a lot easier. This was specifically mentioned by this female farmer, and it so happens that I already have the tool and can back up her endorsement from my personal experience. It's a post driver, and it's basically indestructible. Two people can work together to use it, and that makes things even easier. But I've gotten a 7' post into the ground by myself with this tool. Well worth having if you place posts on a regular basis. The second tip is how to get those posts out of the ground by yourself. The technique is simple. Fill a bucket full of water, and pour it all out right where the post goes into the soil. Apparently this will instantly loosen the ground up enough to pull the post out easily. I heard about the use of horsetail (Equisetum spp.) as a natural anti-fungal compost tea spray for a variety of garden plants. It's supposed to prevent powdery mildew on squash plants, help tomatoes and potatoes resist blight, and help fruit trees resist fungal diseases as well. I don't know how efficacious it is, but this is the sort of remedy that can't really do harm. So I'm definitely willing to try it and see what happens. I'm going to hope we don't have another blight year, but I always get powdery mildew on my zucchini plants, so I should be able to test this spray this year for sure. I attended two talks by Michael Phillips, The Apple Grower . Both of them were excellent and a bit overwhelming. What I learned about fruit trees, their diseases, pests, and health, would be very difficult to summarize even briefly here. I learned a lot though, and will be reading through his book as well as his website, very carefully. He also has another book coming out later this year. I realize that I haven't really paid much attention to my fruit trees, or taken all that good care of them. The intensive devotion to his trees that Phillips practices, as a professional orchardist, is something I will probably never be able to approach. But there are plenty of things I could put into practice that would likely help the overall health of the few fruit trees on our homestead. I'll try to write about these things as I do them. Certainly I'll experiment with using the chickens to help break pest cycles under our mature apple tree this year. I put in a suggestion at the conference that PASA bring Phillips back for a full day track on fruit trees. He obviously had a lot more to say than was possible in the time allotted to his talks. Audio recordings are available of all workshops presented at the conference. This is some consolation for the fact that I can attend only one workshop per time slot. If only I could find a way to be in two places at once. I left a list of the workshops I'd like to hear audio recordings of with a friend who was staying later than we did. So I've got those to look forward to. Sometimes a great presentation is only a mediocre audio recording, because all the visual is lost. But usually I can get something out of them, and sometimes speakers will agree to email their power point presentations or handouts to interested folks. I also came back from the conference with verbal permission to nag three people by email. The first is a woman at Rodale who responded immediately and positively to my inquiry as to whether or not Rodale might be interested in hosting a scion wood exchange and workshop on how to graft fruit trees. (Scion wood is a small branch taken from one fruit tree and grafted onto either bare rootstock or another fruit tree.) The Rodale Experimental Farm is not terribly far from where I live, and it has large apple orchards. A scion wood swap fits well with the sorts of things they like to promote. And it looks like they will; I've already gotten an email back from her that says they'll try to put on something like this next year. Awesome! The second person is a livestock veterinarian with a passion for raising animals on pasture. She's not in my immediate area, but has agreed to come to my tiny homestead when she's next in the neighborhood and consult with me about the feasibility of (some day) having a few miniature dairy goats here. This is something I would love to do, but I think it would take 2-3 years of site preparation to work the way I would want it to work. The third person is the woman who made the mind-blowing fermented ketchup which I sampled at last year's conference. She agreed (again) to give out the recipe. So I definitely intend, very politely, to nag her by email until she coughs it up. My attempts to reproduce the recipe last year were a complete failure. If she follows through, I'll post it here. I guess I'm learning to maximize the schmooze potential of the conference. It really is a seething wealth of walking expertise. And there's a lot more to tap into than just the formally scheduled talks. As for the potato class, I learned a few useful things there too. For one thing, the majority of potato diseases mostly cause only cosmetic defects. Hollow heart, and scab - these affect appearance, but not safety. We can eat tubers affected by these diseases quite safely. In fact, the instructor said that the potato has an awfully good track record as far as food safety is concerned. Humans don't tend to eat potatoes raw, and our cooking methods for the tuber take care of pretty much any microorganism from the field. 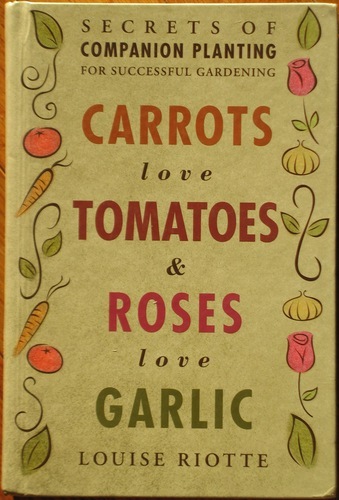 This is great news for gardeners and homesteaders. We don't produce for market, so it matters very little if our potatoes aren't picture perfect. Seed potatoes have a "clock" that determines their physiological age, as opposed to their actual age. The clock starts ticking when the parent plant dies back, or when the potato is harvested, whichever comes first. Temperature determines how fast the clock moves. Seed potatoes are ideally stored at slightly colder temperatures (34-36F/1-2C) than potatoes destined to be eaten (42-44F/5-7C). The more warmth the potato experiences, the faster it ages. The "younger" the seed potato, the fewer stalks the plant will send up, and the larger and fewer the tubers will be. The "older" the seed potato, the more stalks the plant will send up and the smaller and more numerous the tubers will be. Overall, the difference in total yield by weight is insignificant from an older to a younger seed potato. There are several other differences in the way plants from young or old seed will behave, but here's the interesting application of this knowledge... The ideal seed potato weighs 2.25-2.5 oz. (64-71g). You can cut larger potatoes down to use for seed, but it's better to use uncut potatoes if you can. So if you want to deliberately grow potatoes to use as seed potatoes, it pays to use "older" seed potatoes for your planting. If you want your potatoes just for eating, "younger" seed potatoes will give you fewer spuds to scrub per serving, and fewer small potatoes that might escape your notice during harvest. Good to know, eh? And here's another interesting thing I learned. When potato varieties are developed, part of the process is to grow out new strains in test fields which have been deliberately infected with various potato diseases. This is done to observe resistances to common potato diseases, so as to decide which new varieties might be commercially viable. As an aside the instructor mentioned that test fields infected with potato scab virus universally clear the virus spontaneously after a few years, and thereafter it's difficult to reestablish the virus in that field. This off hand comment captured my attention quite dramatically. It has me thinking about soil biology, and how little we really grasp what's going on in there. I guess if you've got scab on your garden potatoes, you can just cut off the superficial blemishes and count on the disease going away on its own, eventually. That would definitely work for me. Well, that's all I got for today. I'll try to be better about regular updates. I wasn't sure I was going to engage with this fracas, but in the end I feel it's necessary. The Dervaes family of Pasadena, California have apparently trademarked the terms Urban Homestead and Urban Homesteading. They dress up this action as an attempt to protect these terms from use by evil corporations. And yet it is the Dervaeses themselves who are now sending what are in effect cease and desist letters to public libraries, bloggers, and other organizations who have used these terms, even without attempting to profit from them. They have privatized part of the commons and are now wasting no time trying to assert their exclusive legal rights. This despite the fact that there are previously published books, magazines, public service organizations and innumerable blogs that use exactly these words in their titles. At least one of them has already had their page shut down thanks to the Dervaeses. There are many things I find despicable about these actions of the Dervaes family. Their behavior is exactly what one would expect from an evil corporation. Monsanto, anyone? It would be one thing to trademark these generic terms and then turn them over to the Creative Commons for all non-evil uses. That is not what they are doing. It would be one thing to take these actions and then actively listen to those people who have formerly supported and admired their work. That is not what they have done. Instead they have, one by one, shut down their social media pages and several of the eight websites they maintain. Recent posts on their main blog (I'm not going to link it here.) have closed comments. They didn't like what they were hearing; it didn't support their worldview. So they refuse to listen. This is a family that has solicited donations, boldly and repeatedly, for years. And yet this family of four able-bodied adults somehow manages to find the spare time to trawl the internet looking for people who have "infringed" on their newly acquired legal rights. It sickens me to think of all the monetary donations given in goodwill that are now paying for the Dervaeses to act like a corporate goon squad. Wise people recognize when they have made mistakes, admit them, and correct them. That is not the path the Dervaeses are pursuing. I was initially only profoundly disappointed with the Dervaeses. Now I'm angry. I have in the past mentioned and linked to the Dervaes family here on my own blog. I can assure you that I will never do so again. I have removed the links that I was able to find. The food production they have managed to accomplish on a tiny amount of land is truly impressive, and by rights it should stand as a shining example of what can be done if one is determined to produce food at home. But this high-handedness over concepts they did not originate and have no moral claim to is unacceptable. They are doing damage to a cause and a way of life that should never be the property of one person, or one family. We need as many people as possible growing food in backyards large and small. That the terms "urban homestead" and "urban homesteading" are now legally restricted does no service to that cause, and may indeed mean that fewer people pursue the goal of home food production. That is wrong, whatever the law may say about it. I'm not on Facebook, but there's a group making an effort to reclaim the term urban homesteading. Check it out if you use Facebook. If you've ever linked to, publicly praised, or financially supported the Dervaes family, I would urge you to weigh in on this matter, either on your own blog, or by sending a message to the Dervaeses. I think it pays to be civil, no matter how much you may disagree with someone, so I recommend you keep it polite. Rudeness and name-calling only make it that much easier for people who disagree with you to dismiss what you say out of hand. 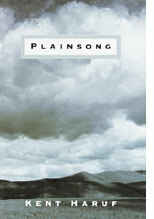 I'm off to PASA's Farming for the Future conference in a few hours. I have two hopes. Firstly, that winter will give us just enough of a break to make it there and back again safely. Secondly, that I learn plenty of interesting tidbits to share with all of you, and come home with the fuel-injected sense of motivation and excitement that the conference has provided for the past four years. Honestly, I don't know how I'd get through the impending spring busy season without this incredible boost. It's worth every penny of the registration fee. I'm really looking forward to the fun!